When solving the control and design problems in aerospace and naval engi neering, energetics, economics, biology, etc., we need to know the state of investigated dynamic processes. The presence of inherent uncertainties in the description of these processes and of noises in measurement devices leads to the necessity to construct the estimators for corresponding dynamic systems. The estimators recover the required information about system state from mea surement data. An attempt to solve the estimation problems in an optimal way results in the formulation of different variational problems. The type and complexity of these variational problems depend on the process model, the model of uncertainties, and the estimation performance criterion. A solution of variational problem determines an optimal estimator. Howerever, there exist at least two reasons why we use nonoptimal esti mators. The first reason is that the numerical algorithms for solving the corresponding variational problems can be very difficult for numerical imple mentation. For example, the dimension of these algorithms can be very high. Preface. 1. Guaranteed Parameter Estimation. 2. 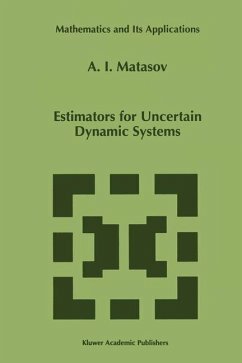 Guaranteed Estimation in Dynamic Systems. 3. Kalman Filter in Guaranteed Estimation Problem. 4. Stochastic Guaranteed Estimation Problem. 5. Estimation Problems in Systems with Aftereffect. Bibliography. Index.